Welding is a career with a lot of advantages: exciting job options, good pay, and lots of room for growth to name a few. However, one of the best things about being a welder is that welding can be fun. It’s that fun and excitement that draw crowds to Welding Thunder, an annual welding competition established by Welders Without Borders. “Three years ago I realized the need for a fun and exciting competitive event that would allow welding students and teachers to showcase their skills,” said Welders Without Borders founder Samuel Colton Sr.
A team of students at work on their project at Welding Thunder 2013. Setting up a welding competition was a daunting task, but Colton came up with an innovative approach that helped him manage the complicated event logistics: a welding team invitational where student teams travel to the event with portable equipment and run completely off engine drive welders to build a pre-engineered project. “So teams roll in, completely mobile, and set up in a parking lot and weld,” Colton said. This proved to be an elegantly simple solution that resolved any potential problems sponsors might have had getting enough power for the competition and setting aside enough space for equipment. Less complications, more fun. Plus, the aggressive thrum of the engine drive welders led to a naturally memorable name for the event. 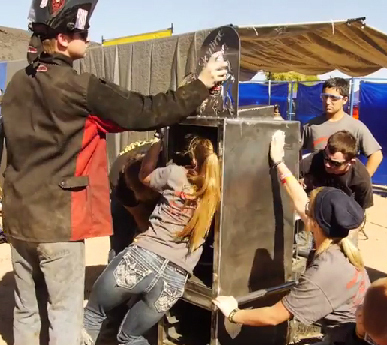 Who doesn’t want to compete in a contest called Welding Thunder? The competition is held over two days. On day one, teams use the provided drawings to weld their core project. On day two teams are informed of the secret components (custom features) that must be incorporated into their project. Student teams can only have four active welders at a time, but those welders can tag in and out so that as many different students can participate. “This is the third year for the event, and it will be held in Arizona and California. I can only hope the program will continue to spread to all 50 states,” Colton said. Arizona is in year three of a five-year rotation for hosting the event, while California is holding its first annual event. 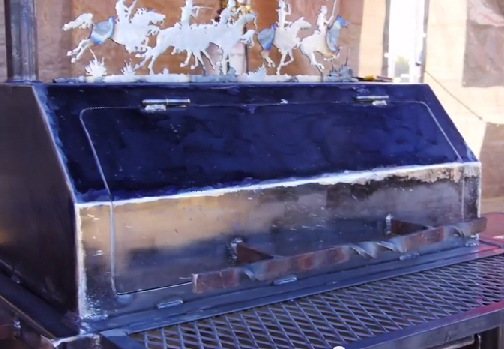 Notice the cowboy motif atop this grill, a team project created at Welding Thunder 2013. “Support from members of the American Welding Society District 21 has been unbelievable, and everyone associated with the program realizes that the event guidelines and structure allow for a truly unique and quality experience for students, teachers and industry supporters,” said Colton. This year, Welding Thunder California was held at Santa Ana College in Santa Ana, California on October 10th and 11th. Skyline High School in Mesa, Arizona will host Welding Thunder Arizona (with a “spooky” theme for the holiday season) on October 31st and November 1st. For more information about Welding Thunder and Welders Without Borders visit the organization’s website and the resources cited below. For more information about other fun welding events, as well as digital tools to help you advance your welding career, keep checking in with American Welding Online.